We are a leading stockist within the UK for this Italian manufacturer of ‘HO’ models. Their range covers locomotives, coaches and wagons from many European countries. We have a good stock of their items, and can also accept pre-orders on future releases. C&M Models are an appointed stockist of the normally-crowdfunded range of Cavalex Models. 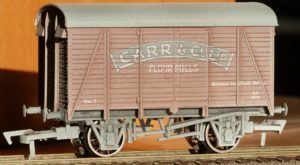 The next models to be released are a further run of their ‘PGA’ hopper wagons in assorted variations of the plain white and ‘Redland’ liveries. Price is £32.50 per wagon. 2019 Announcement. We are taking pre-orders on the following items, plus anything else from the forthcoming Hornby range that you would like. Following on from the success of our Carr & Co. biscuit manufacturers van, we have commissioned a further van from the same group of companies. This time it is the Carr & Co. flour mills at Silloth. This time, we have had made a pristine version, as well as a weathered version, the weathering being done in white to reflect the colour of flour powder. (click on this text to go to the relevant section of our online shop), or over the phone, or in the shop. 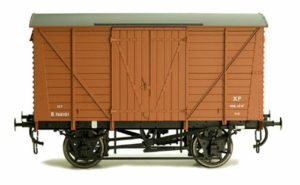 Our other exclusive edition is the “Keswick Co-operative Society Limited” 7-plank open wagon. With acknowledgement to the Cumbria Railways Association for providing the photograph of the prototype, this wagon is very much associated with the heart of the Lake District. Following on from the success of the Hornby Class 87 in ‘OO’, Heljan have announced a re-tooled Class 86. Initially, they are producing versions from the early part of their lives, as the AL6s and Class 86/0 (without mulitple working boxes). We are happy to accept advance orders for these models which are expected to be released towards the end of 2019. 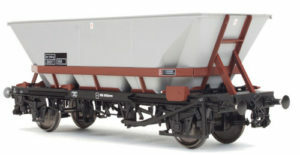 We now have available from stock a number of Dapol ‘O’ gauge wagons. 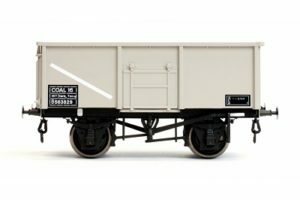 There are several variants of the the ‘HAA’ merry-go-round coal hopper, with different coloured cradles. 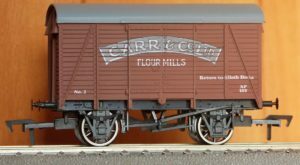 A number of different BR 12 ton vans and a good variety of the 16 ton mineral wagons. Our prices are also competitive with Tower Models. 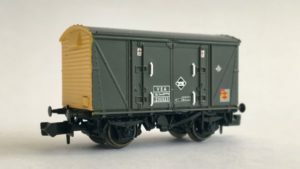 Announced in September 2018 were new ‘N’ gauge models of the Class 128 parcels van d.m.u., the ‘IPA’ single-deck car carrying wagons, plus new 20 foot tank-tainers from ‘C’ Rail. Also to be made available are further runs of the Pendolinos in previously unreleased liveries, as well as new liveries of the ‘N’ gauge TEA tankers. We await final details of the exact models being done, but we will be stocking these. Remember, if you are unable to afford pre-paying under the crowdfunding operated by Revolution Trains, our terms are payment on despatch, allowing you to spread your payments. 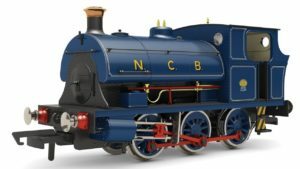 The order book is now open for the Revolution Trains N gauge ‘VEA’ vans which are expected to be with us in July 2019. Price will be £19.95. The RfD version, shown here, is as used for MoD traffic around the Cumbria area, and has the Carlisle Currock fox logo on the side. We still have stocks of this 7-plank open wagon left. Mealsgate is a village on the A595 road from Carlisle to Cockermouth, and was on a branch line from Aspatria. Hornby International have announced the release of these iconic French high speed trains in two of the most popular versions – the Duplex double-deck trains in the Euro livery often seen running into Germany, and the Thalys version which runs to Brussels, Amsterdam, Cologne and Dortmund. By choosing the correct sets and additional coaches, the full 10-car sets are easily assembled, and we will be happy to advise you on what you need for this, and process your order for you.